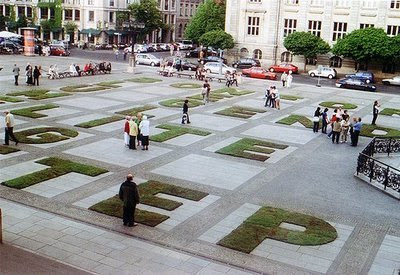 As an obsessive crossword addict that spends a portion of Sundays on the couch working on the NY Times puzzle of the week, (and time-permitting some of the weeks puzzles as well) I couldn't resist this interesting installation that arcady over at gardenhistorygirl dropped on her site last week. 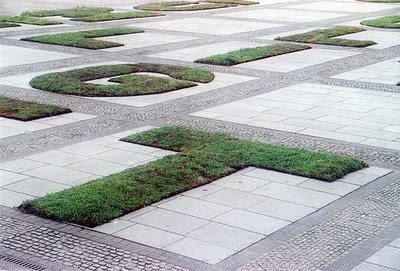 Call it at-grade green roofing meets land art meets typeface design - this 2007 installation by studio msk7 temporary crossword puzzle installation at the Berliner Gendarmenmarkt. 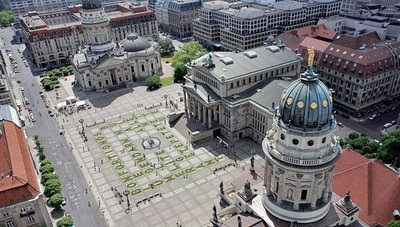 From msk7: "From 5th May to 17th June 2007 the artists’ group msk7 is transforming Berlin’s Gendarmenmarkt into a walk-in crossword puzzle. 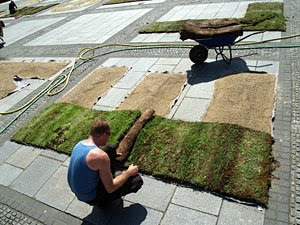 Special vegetation mats form words, citing the Berliners’ penchant for absorbing French words and sounds into their everyday speech. ...“The history of the language of the urban populace is also part of the history of the city … Huguenots, French émigrés fleeing the Revolution, on numerous occasions occupying forces. They all left traces that linger, which, sometimes well-concealed, surface again in common turns of speech and in typical snappy Berlin sayings and are also always time capsules recording echoes of their era.” (Ewald Harndt, "Französisch im Berliner Jargon")"
And some of the installation photos, as the 'solution' to the puzzle was discovered and filled in. 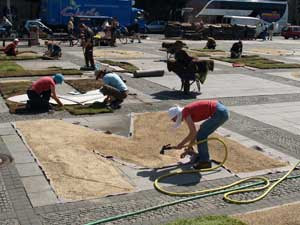 I think it's a fascinating idea of an interactive and ephemeral landscape installation that involves connection with the community in a literal and physical way. 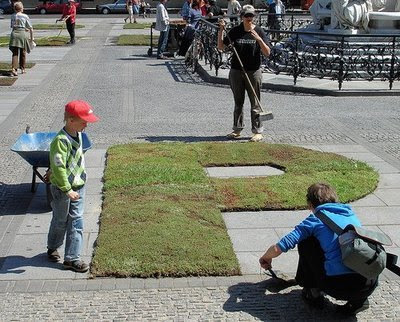 As many installation reference community, this one really engages - through public space and language, the idea of community interaction.